That is how it started. I enrolled for #PBChamps this year and sure enough the book came within a few days. When I read it, and realised that it was a play, I figured I had two choices - adapt it to a story, or get people to actually act in it. The first option was enticing. But then I went and asked my boys aged 12 and 14. They nodded and hence started the madness. Ishaan Singh (14 years) and Vivaan Singh (12 year) roped their friends in and soon The Travelling Nautanki was born! Ishita Kalra (14 years), Roza Majumdar (14 years), Prisha MainRai (12 years) and Nidhipa Dev Mainrai (9 years) joined us and roles were assigned. All hell broke loose as we struggled to take the play ahead. I had never acted in a play (unless being a tree counts) and neither had I directed one. The children had mostly participated in group events at school. The next three weeks were spent practicing relentlessly - dialogues were learnt, minor changes made, props prepared and more practice done. The minor change in question being that we changed it to Ladli from Ladla. We hope that we will be forgiven for that. We even made a mobile horse (stuck on a toddler scooter)! Then came the big day! Morning saw us packing the Travelling Nautanki up and leaving for Savera. This is a school for the economically disadvantaged children. 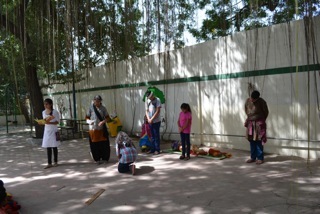 There were around 30 children here who thoroughly enjoyed the play. Everything went off smoothly barring one incident of the horse toppling over! Well our horsie is like that - he drops off to sleep without a warning. 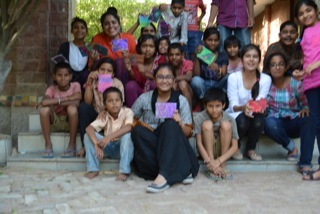 The play was followed by an art session where everyone made scratch-art cards for others using oil pastels. The second half of the day was spent at Karm Marg. The play went well (horsie too decided to be a good chap). Loud applause greeted the kids! 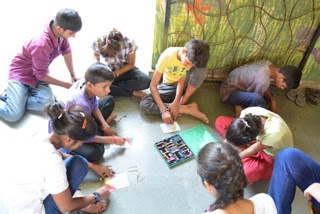 And the art session saw around 40 participants. I smiled and drove on. A tiny bunch of kids have been unleashed for good. And they are now looking for their next set of victims whom they can infect with love for stories. 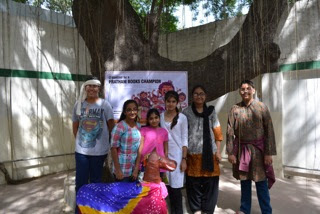 Thank you Tanu Shree for helping coordinate this event and to the Travelling Nautanki for giving life to this story!